Over the course of my four years at KXSC, the station has been frustratingly passive in the manner in which it addresses race as a topic. I will maintain that KXSC is and always has been the most intelligent, thoughtful, and interesting group of students with whom I interact on USC’s campus, and yet we regularly commit a grievous error by failing to ask questions about our identities and those of the members of our community. From the inception of a student’s involvement with the station, race is not considered, as every semester when we select our new class of interns, we do so by evaluating an application that does not take race into account. One could argue that not thinking about race is not racist, but the erasure of race is itself problematic. Another topic that is routinely ignored is the subject of privilege and its integral role in the daily functions of our station. As the General Manager of KXSC Radio, I must confront my own privilege constantly. The demands of my role at the station can be equated to a full time job, and yet I receive no pay for my efforts. I dedicate 40+ hours a week to an endeavor that returns no monetary gains, sacrificing time that I could be using to earn money. I highlight the requirements of my job only to demonstrate how I am immensely privileged in that I can afford this luxury, as KXSC has directly contributed to my personal and professional development in countless critical ways. If I were a student who relied on the security of a regular income, I could not be such an active member of KXSC’s staff. Every student who dedicates themself to KXSC in a similar capacity is required to sacrifice valuable time and resources in the pursuit of station aims. There are undoubtedly innumerable benefits to involvement with our organization, but we cannot lose sight of the very real fact that as an organization, we do not provide for our members in a substantial economic manner. We lack the resources to be able to do so, and thus we attract and retain only those who are privileged enough to meet the demands and accept the consequences. Former R&B Director Zoe correctly states in the introduction to her BHM playlist that “American popular music IS Black American Music.” We are a radio station that broadcasts popular music of all different formats, and as Lani points out in her post, the vast majority of KXSC staff and DJs are not students of color. The privilege inherent in the act of playing historically black music as a white DJ escapes us every day. Acknowledging privilege at the station means taking responsibility. It means noting the significance of this act and considering the cultural and historical resonance. It means paying respect to the history and the heritage of the music. It is action, not passivity, in so many forms. 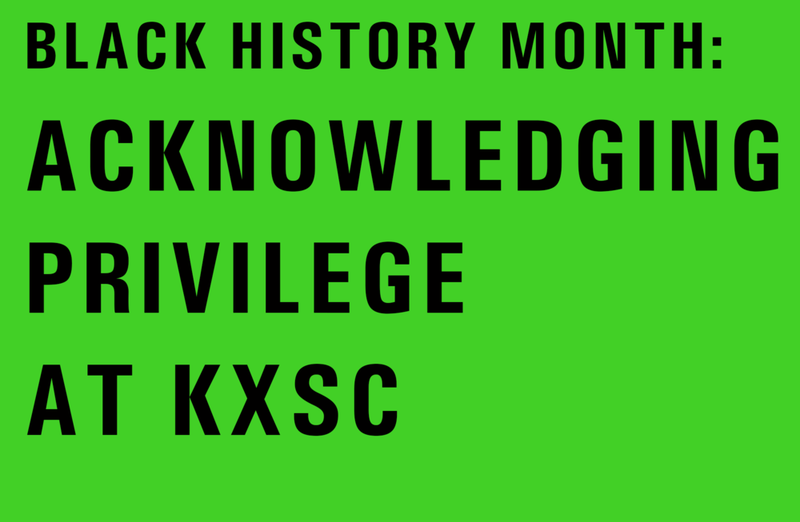 This Black History Month, we have challenged ourselves to consider how our privileged status impacts the KXSC community. I am calling for an acknowledgement of the fact that although we are a progressive group of students, we do not address frequently, if ever, the problematic lack of diversity and silence regarding race at KXSC. We are the campus radio station, not the Black Student Assembly, but we are a community and an organization through which the voice of the student body is amplified. Thus, it is imperative that we conduct ourselves in a manner that promotes difference and diversity rather than negates it. KXSC is a community in which every intern, DJ, and staff member should feel included, valued, safe, and heard.